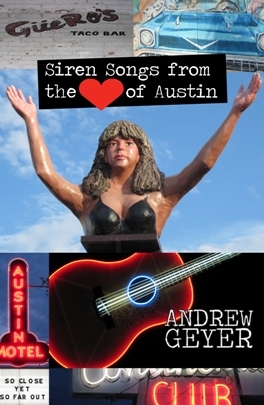 The twenty-two first person pieces in Siren Songs from the Heart of Austin are interwoven through setting, recurring characters, common themes, shared imagery, and intertwined plots to form a larger whole that tells the story of a group of people living in Austin, Texas. Aqua Vitae Café, in turn of the millennium Austin, is the central connection—although the settings range from Austin to New Mexico to Guatemala and Honduras. In one of the six main narrative threads, a young Latina hunts her mother’s killer while her grandfather tries to win the love of the murderer’s grandmother—who has the power to see the future—in a case of love at first sight delayed for Decades. In another, Annie and Barkeep deal with death, autism, and the difficulties of the food and beverage business, and find love along the way. Another thread features Dr. Joseph Jasmine, a down-on-his-luck young professor moonlighting as a waiter and trying to hold his marriage together. Kurt, an Austin twenty-something, seeks to leave behind his love troubles and start a new life as a stranger in a strange land—but as he discovers, the distance between the past and the present is more than a matter of miles. And through it all, the Prophet Mudcat sings his siren songs, trying to usher in the Age of Aquarius by returning humankind to the water . . . .